Out of Sweet and Salt pongal, sweet rice pongal or sakkarai pongal is my favorite. Rice and dal cooked with jaggery, ghee, cardamom, cashews and raisins, makes it flavorful and tasty with a divine aroma at home. This could be made with pressure cooker or in a traditional way by boiling rice and dal and later adding jaggery to it. My mom makes this dish during pongal and any other special occasion or any other day when we feel like eating it. So here i have cooked the sakkarai pongal by myself for the first time. Wash the raw rice and green gram dal twice. Pressure cook the rice and dal in the pressure cooker and cook for 4 to 5 whistles. Once the raw rice and moong dal is cooked, remove from the pressure cooker and mash it nicely and keep aside. Heat a heavy bottomed pan, add jaggery and pour little water just enough to soak the jaggery and allow it dissolve. Once the jaggery dissolves, add the mashed rice and dal and mix well. Add ghee at this stage and slowly stir the sakkarai pongal in a medium to low flame until the ghee leaves the sides of the vessel. Powder the cardamom pods and add to the sakkarai pongal. Heat ghee in a small pan and roast the cashews and raisins and add to the sakkarai pongal and mix well. 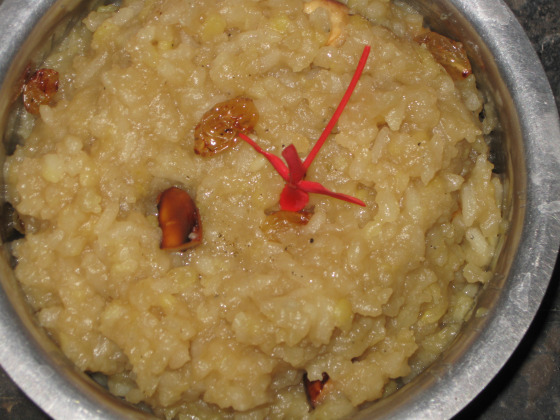 Serve the Sakkarai Pongal hot after doing Neivedhyam.